Last February, I experienced the most memorable Spring Festival of all my years in China, celebrating it in rural Henan. I had heard the Spring Festival in the countryside is more authentic. I could imagine there would be more wine drinking, more fireworks, more traditions. However, I had no clear idea what was going to happen until I went there. One of my Chinese friends had invited me to spend the holiday with his family in his hometown of Baichi, a village of 5,000 people living in courtyard-style homes under the jurisdiction of Puyang city. It's about 500 kilometers south of Beijing, a six-hour bus ride. There, I was picked up by my friend, and we drove south for almost another hour into Nanle county to reach Yuancun town. What became quickly apparent was that the food was fresher there, and the people's hearts warmer. Most people in Baichi raise a few chickens, pigs, or other livestock. Every day, there are fresh eggs and locally grown produce with the meals. Americans like to talk about "farm-to-table" cuisine, when they are referring to food coming from farms situated far from their cities. In Baichi, much of the food is produced in the same household where it's eaten. Each night, we would eat dinner at my friend's home before heading over to a neighbor's home to drink beer. At each house, they would bring out plates of sausages, lotus roots, and duck. The many dishes weren't just snacks; they were a full-course second dinner. Rural hospitality (particularly during festivals) insists that you will have food to eat — and lots of it — when visiting someone's home. The big finale was the Spring Festival Eve feast in the afternoon. Tables were set up in two rooms and loaded with food. Family members came from near and far, and village friends dropped in from just down the street. Everyone who came, it seemed, brought at least one bottle of Chinese liquor. The process of drinking seemed to follow approximately this routine: every cup was filled at the beginning of the meal. With loud words of toasting, we drank it down to wish each other a happy new year. If your cup was empty, someone would come along to fill it again; if it was full, you were to take a shot. Ganbei (cheers)! Youngsters were playing outside with gunpowder-filled toys. A toddler was lighting a kind of mini firecracker and then tossing it in front of him. It would explode in a small puff of white smoke about five seconds later. Fun for the big boys would come that evening when half the village launched real fireworks into the air from their courtyards at midnight. On one of the days after the new year, we went into the town to visit a temple fair. The temple was honoring Cangjie, a local mythical figure credited with creating Chinese characters while he served as an official to the Yellow Emperor (ca. 2700 BCE). Outside the temple, carnival-related games, bumper cars, billiards tables, and more were provided for play. The next day, the fun was over. We took a train from Anyang to reach Nanjing. Though we bought the tickets in advance, we still weren't able to grab tickets with seats. Everyone was heading back from their ancestral hometowns where they had spent the Spring Festival to the big cities where they worked, studied and lived. So, we had to settle for wu zuo, or "no seat," tickets for the 10-hour journey. We weren't the only ones. The train was incredibly crowded with wu zuo ticket holders when we got on. The departures board at the ticket office showed a big line of wu characters indicating every train was sold out. There were about a dozen people standing in the passageway connecting two cars. There was almost no way to move. At Zhengzhou, I was able to squeeze my way into the carriage and sit in the aisle. Northern hospitality was on display, however, as someone was nice enough to offer me a portable stool to sit on. 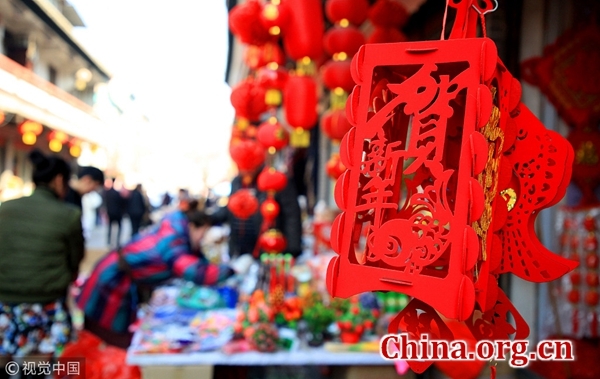 Spring Festival in the countryside was more flavorful and spirited than in the big city. The traditions and community feel of the village are a positive force in a world that struggles to keep up with incessant change. When I arrived in Nanjing at 3:30 am, exhausted but energized to get off the train, I was happy to have made the trip.